The kitchen garden in all its spring glory. 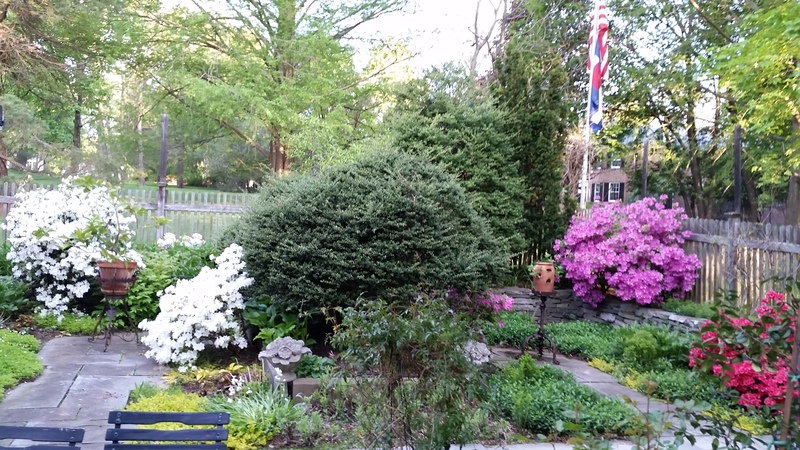 The boxwood in the foreground is where Bushy and Jerry nest every year. The one in the background to the right is where Robbie the robin is staking his claim. Bushy singing her little heart out on the top of her bush. 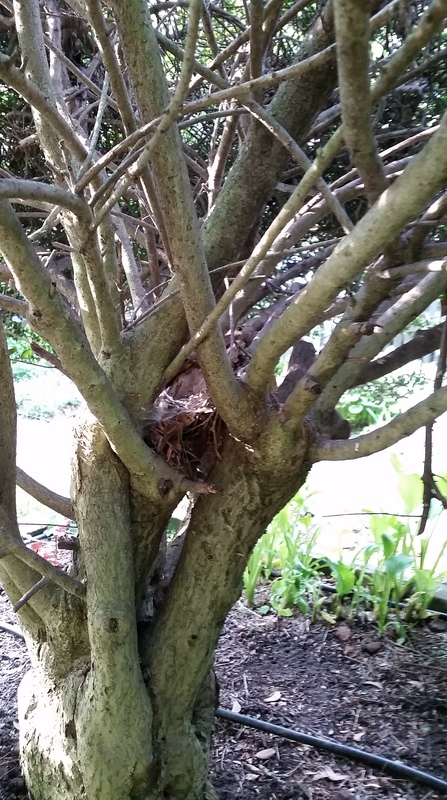 Bushy and Jerry’s nest in the boxwood. Needs some spring cleaning and sprucing up. 2 years ago, Bushy and Jerry had a son who I named Eric, as Bushy calls to him in a slightly different way that sounds just like the name Eric: “Errrrric! Errrrrrrriiiiiiic!” Being a kid, Eric would get in trouble from time to time. One day I heard a great commotion outside, all the way inside the house. Bushy was going crazy. She was on top of her bush screaming Jerry’s name over and over. I went outside to see what was the matter. By the time I got out there, Jerry was perched on top of the garden fence, flapping his wings like mad, looking down on the ground. Bushy looked at Jerry. “JEHREEEEE!” she screeched. Jerry did a dance and screamed “ERRRRRRIC!! !” Bushy joined in horror, “ERRRIIIIIIICCCCC!! 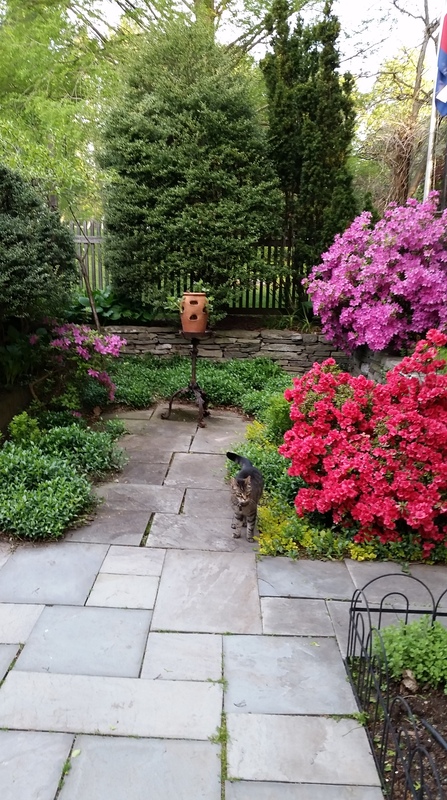 !” I looked where they were both looking and there was Eric, pecking around in the impatiens, like all teenagers, oblivious to his parents’ aggitation. Sneaking up on him was my cat Riley (cue the theme to the movie “Jaws.”) Uh-oh. Riley, the villain of the story. Jerry and Bushy were besides themselves, hopping on their perches, wings all a-flap, screaming Eric’s name over and over as Riley crept up on what else, but cat’s feet. Just before things got out of hand I scooped Riley up and in a blur of flapping wings Eric flew inside the bush followed by Jerry and Bushy. I can only assume a huge avian time-out was in order. Bushy seems to be the only bird intrepid enough to remain in the boxwood for winter, as she leads a silent solitary existence bush-side, only emerging long enough to dust snow off the leaves. Jerry is not cut from the same hardy cloth, he vacates to parts unknown (maybe he goes to Florida for winter or on the comedy circuit in Las Vegas.) Eric must be in college as he flew the coop last year never to return, not even on Mother’s Day. I know it’s spring now because Jerry has returned. Bushy is all happy about it. 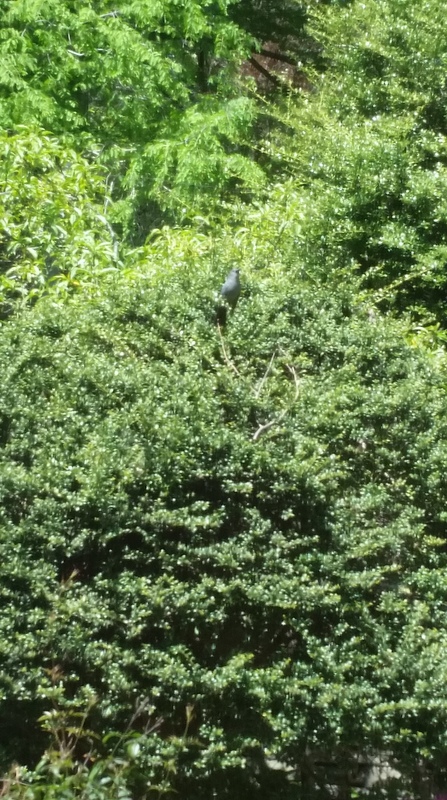 For the past week I have been serenaded daily by her from sun up to sundown as she sits singing her little heart out on top of the bush. Yesterday she sang a merry tune all the while adding leaves and twigs to her nest in the bush. 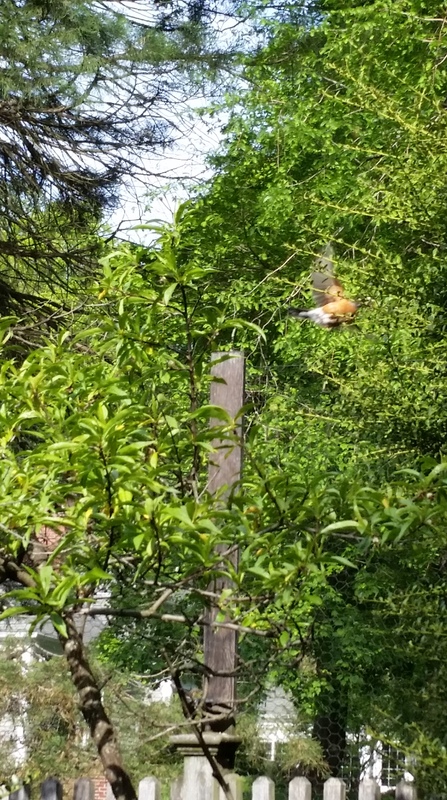 While this scene of happy domesticity is playing out, Jerry is on a mission- to thwart Robbie the robin who is building a nest in the bush next door from encroaching on his territory. Robbie’s no slouch, he can dive bomb like the best of them and does so with gusto at Jerry. That makes him nuts. Robbie on the attack, defending is nest in the boxwood next to Bushy and Jerry’s bush. Soon enough things will settle down in more of a quiet routine. Bushy will take to her nest, presumably to incubate eggs, the days will get longer, hot and languid. Flowers will bloom and die, other plants will grow and bloom. Bees will buzz and birds will sing at less volume and only in the cool of the early morning and late evening. But for now I adore being serenaded from sun up to sundown by my kitchen garden dweller Bushy. 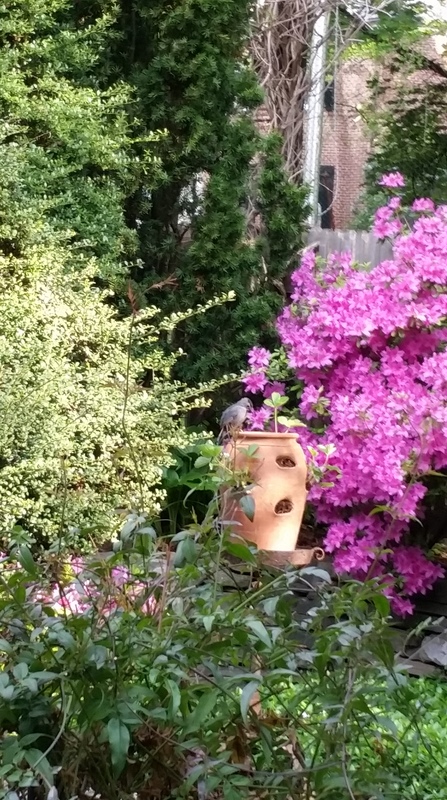 Categories: Diaries, Musings, West Orange NJ: Home Base | Tags: Azaleas, Birdsong, boxwood, Essex County NJ, garden, Impatiens, Kitchen garden, Riki Tiki Tavi, Robin, Rudyard Kipling, Spring | Permalink.